A key figure in the research and study on natural sound (field recording) and a member of AIPS - the Italian archive for soundscape art -, for many years Enrico Coniglio (Venice, 1975) has been bringing forward an original form of dialogue between acoustic elements of the real world and electronic sources of sound: two different practices of reconstruction of physical or imagined places through a subjectivity particularly sensitive to changes. Memory, storage, catalogation and preservation of an identity that time and the intrusiveness of human actions gradually subtracted from those which are veritable "sound ecosystems", a sensorial heritage which has never been given due attention but which, since R. Murray Schafer's seminal studies, has also found many new acolytes devoted to the listening, analysis and interpretation of a universe that today is much more likely to remain parallel rather than intrinsic to our daily lives. With Enrico there's been talking about the role played by the artist in developing and consequentially spreading his research, about the delicate balance between replication and interpretation, and about the supposed necessity to involve the public in the creative process as well as in the "reading" of the deriving work of art. What counts, really, is to have a chance to talk about all this, but most of all to listen and to finally attribute due importance to the spontaneous language through which the world speaks to us. What's the source of this particular interest towards natural sounds? Did you meet any teachers that guided you in this field or was it an innate character? My interest is oriented towards the sounds of the environment, where its naturalness can prevail or succumb to its artificiality. It's the uncertainty of the outcome from this confrontation that activates my ear and my curiosity. I was born in a city, Venice, which is characterized by large spaces of silence now sadly contracting, partly because of mass tourism and its effects on everyday life. Since childhood my ear has been trained to listen, to find musicality in everything around me. I recently retrieved some old audio tapes dating back to the 80's, on which I found the recordings made with a Toshiba laptop in very difficult times, when I still didn't know anything about the history of phonography, except for some Futurist musical work. I carried around with me this walkman, in Cadore, on the mountains, and I recorded fountains and birds and cows grazing at the grass, small souvenirs of places I liked that I could listen again at home. Unlike other artists in this field, your expression maintains a persistent dialogue between the acoustic sources of the real world and the artificial ones - which in some cases come to the point of blending and penetrating one another. Is acting in this direction more like a gentle "intrusion" or an attempt to establish a dialogue and a mutual exchange between the two areas? For several years now, also thanks to some recent artistic residencies, I've been working on the idea that the concept of "margin" could be a new model for the interpretation of contemporary soundscapes. The focus of my research is precisely situated on that uncertain border between nature and artifice, landscape and manscape, in order to show that, for many areas of the Italian territory, making a distinction between the two seems to be almost impossible. To answer your question, I would say it is more of an attempt to create a dialogue between different sound sources, in that grey area where the different pieces of the landscape tend to fit together. There's not so much of an aesthetic intention in combining seemingly conflicting sounds, as the attempt to conciliate them, even painfully so, reflecting the acoustic experience of the world in which we live. However, in the musical composition, space and time are folded and redefined at will. Being an artist do you feel more like a medium to convey something that already exists but isn't listened to, or the carrier of a strictly personal point of view on reality? There's no doubt that sometimes the creative thought seems to arise in totally unexpected ways. Several times this brought me to fantasize about human beings originally endowed with invisible earners, antennas capable of capturing stray signals, coming from who knows what dimension. Or maybe all of this is simply due to the large amount of inputs to which we are subjected every day and that, combining afterwards at a subconscious level, may give rise to insights that sometimes translate into creative actions. It's certain, though, that the representation of a place in the form of a soundscape composition can only account for a highly personal interpretation of reality, and at the same time express the transposition of a broader view of the world. Together "Astrùra" and "Solèra" form a diptych ("Bragos series", recently published by the experimental music label Silentes) dedicated to the Venetian lagoon. It's a sound environment you've returned to several times in your path: what relationship did you establish with it over the years? What developments led you to the latest intervention? A few years ago, when I had just started to focus on the concept of "topophony", what I had in mind was a more imaginative Venice, so my representation of it certainly seemed more musical. Today I'm especially interested in documenting the identity of this place and in restoring an image closer to reality itself. Over the years, the theme of sounds which are part of marginal areas has become increasingly important in my approach to the investigation of the territory: the "terraqueous" environment of the Venice lagoon is an ideal field of study in which to apply this research model. Thanks to Stefano Gentile, the label owner, I was able to give voice to recordings dating back to 2010, collected during a foggy spring day in the harbor mouth, that eventually became the "Bragos series". With "Astrùra" and "Solèra" - two 10-inch records named after types of lagoon waters, accompanied by some magnificent photographs by Stefano himself - the flow of field recordings, although playing a lead role, is propped up by harmonic inspirations that disanchor the listener from reality, to create a sort of a bridge towards a new one where fantasy is free to roam. However, the two works are not meant to return a nostalgic image of Venice, but to push us to reflect on its fragility. In the liner notes of the discs I wanted to pin this idea: "The soundscape is a subjective, ever-changing construction and its evolution, then, goes hand in hand with that of the territory itself". Over the years you also took part in a few artistic residencies. Tell us a little about how this kind of experiences unfold and what lessons did you draw from them. In 2015 I was invited twice in Campania to document the soundscape of an area before Fortore, in Benevento's hinterland, and then the Irpinia, outside Avellino, in both cases close to the Apennines. The first residency was held in June at the LIMINARIA 2015 - #unmappingtime, organised by Interferenze, Scafando and Tabularasa Eventi. The second one, named AQUA MATRIX, was held in December and was organized by Flussi Art Media Festival in collaboration with the Irpinia Madre Contemporanea association. In the days of the residencies I got the chance to explore the territory, led by the guys from the various associations, through the practice of field recording, to finally return them in the form of listening sessions proposed to the public at the end of the stay. Although the landscapes were substantially different - the more bucolic Fortore, the harsher Irpinia, also due to the seasonal difference between the two residencies -, what I experienced in both cases is quite obvious. The scenic beauty of some areas (urban, rural, mountainous and peripheral) of the Italian territory is what it is by virtue of their particular isolation, the remoteness from major traffic arteries, and thus thanks to the fact that they escaped, even in small part, the logics of exploitation of the territory. Aside from the opportunity to visit new places, meet a lot of nice people and enjoy wonderful food and wine, the experience of the artist residency gives full meaning to field recordings and performances, or installations, based on collected sound materials. It's not trivial to propose to the inhabitants of a region the sounds of the same place in which they live, for many valid reasons: the main one is that, returning to your previous question, with a stranger's eyes you convey a totally different narrative of their daily reality. A kind of storytelling that might be able to set in motion the positive growth dynamics of a community's sense of belonging and make it question itself on the matter of local identity. 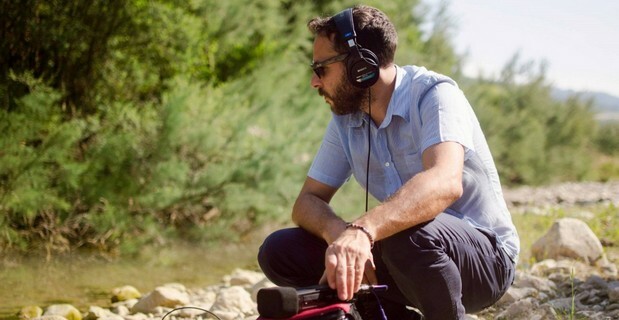 The art of field recording gains a special meaning in the context of collective, site-specific listening sessions, with the help of a specifically prepared amplification. For you, securing your work on a physical format has a documentation value in respect to something you've created in a given occasion or is more of a real "album", a different perspective on the same project? On the one hand I think many musicians look at the "physical format" as to the finish line of a working period - recently we talked about this with Giovanni Lami (Lemures); it's like putting a landmark on an ideal axis of time, on the evolution of their own path, allowing them to proceed further. Knowing that my music has been fixed on a physical medium gives me a sense of security, even though I recognize the obsolescence to which the objects that surround us are subjected. I think it's a natural, somewhat narcissistic need to leave a sign of your passage; nonetheless, I still belong to the cult of the material object and of its design. However, I also strongly believe in the power of digital distribution of high quality audio files, which also gratifies the most demanding ears and allows a larger spread. As you may know, with my friend Leandro Pisano I manage the digital label Galaverna which, aside distributing works of artists engaged in various ways in the field recording practices, aims to promote a pondering on your own soundscape starting from the concept of "post-digital". Again on the experiential character: we already had an exchange of views on the need and / or the usefulness of providing the listener with the tools to learn more about the genesis of a research work on sound, whether it be through guided listening or workshops and participatory performances. Some artists prefer to maintain an aura of secrecy around their work, handing the public a "finished object" that can reveal certain practices or certain suggestions itself; others, instead, strive to play fair, including and involving the listener as much as possible within a project, going so far as to assign him the role of co-author. What's your point of view on this matter? Do you think that, to some extent, it is necessary to "take sides" on either party - that is, to clearly define the respective roles - or that one should find a balance between the two? There's no doubt that everyone has the right to present himself as he wants: the important thing for me is to declare, even implicitly, the chosen type of approach. This doesn't mean building barricades: I think it's a simple matter of honesty, especially for those who work primarily with digital devices. From the listener's point of view, then, each one has the right to enjoy the performance just for what it is, extemporaneously and without over-structured explanations or induced meanings; a purely emotional, uninformed perception. On the other hand, from the point of view of who presents the work - let's simplify and call him "sound artist" - trying to mediate, unravelling the mystery (the exact opposite of the concept of acousmatic, in which the causes of the sound are not disclosed) may be a way to expose the public to a greater understanding; not secondarily, to prove that you are actually working on sounds, that to a cause correspond one or more effects. It is certainly important to be faced with an attentive and curious listener, but the fact of revealing the secrets of the trade does not necessarily trivialize your work. For years I felt the need to declare this belief, to the point of writing a manifesto on the subject. Today I radicalized this need with the collaborative project Tavoloparlante (together with Nicola Di Croce) in which, with varying degrees of participation and a lot of will to play, we invite listeners to become co-authors of the performance. What's the experience that interested you the most so far, or the one that gave you more possibilities of expression? Recently a friend of mine, Enrico Ascoli, got me into a sound design work for the BBC: a precise list of Venetian "sound effects" to be collected for a radio drama set in the Jewish Ghetto. I accepted on the spot with enthusiasm, since I live five minutes from that area. Too bad the story takes place in the 17th Century, so that I had to avoid every sound unrelated to that period. I'm talking about this experience because it was the most difficult and frustrating challenge I've ever faced. When you go out on the street and hit the infamous button "rec" you realize that there isn't a single minute during which the sky doesn't get crossed by a plane from the Tessera airport; not a moment where a motor boat does not move the waters of the inner side channels, or where you cannot hear a trolley rattling on the ground, the ringing of a mobile phone, the click of a camera. What was supposed to be a two-day job became a torment nearly two months long. My respect goes to my wife and friends, who also got involved in this absurd search for the sounds of an illusory city. Ultimately, just to realize that this everyday life from a mythical past simply doesn't exist, even in the remotest corners of the city. Only this we can document with honesty. How did it go in the end? Hours of recordings, many more of editing. The sonic signature of Schafer here is lost, it's a fake, a fraud. The City of the Doges is just a cheap mask, which barely meets a frivolous, picturesque need. I'll stop here. But really, most of the field recording works I'm interested in today are free to download from labels such as Gruen rekorder, Crónica, Impulsive Habitat, Green Field Recordings, Galaverna (self-promotion!). Take a look, you won't be disappointed.